Skiriotissa Mine - open pit mining. A copper mine on Cyprus. 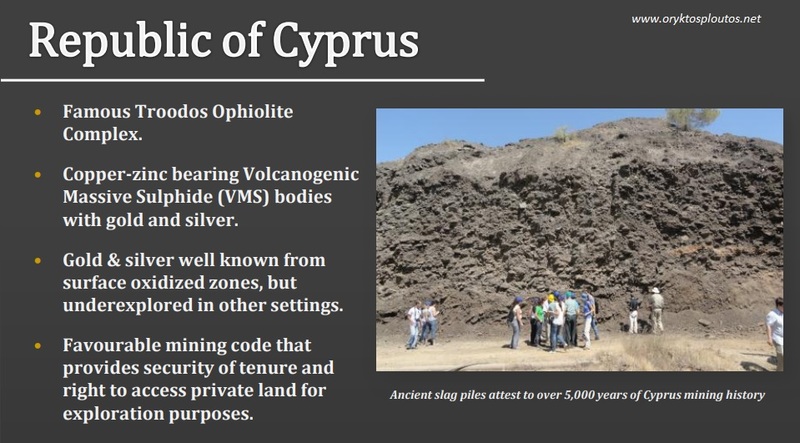 The mining industry of Cyprus was active in the production of minerals of copper, iron pyrite, gold, chromites as well as asbestos fibers. 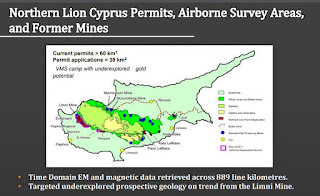 Since 1979 the mining industry of Cyprus is in recession because of the exhaustion of the known large and rich copper and iron pyrite ore bodies and the increase of the production cost without proportional increase in the international sale prices of metals. 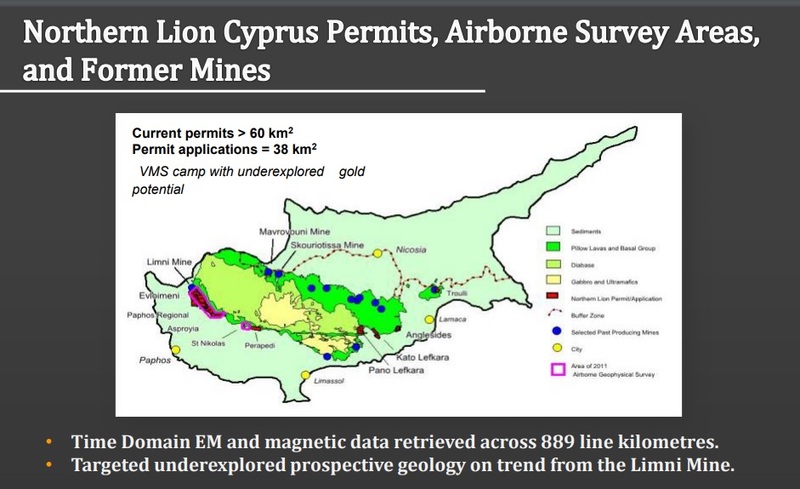 The only mining activity that exists today in Cyprus is the copper mine of Skouriotissa which produces, since 1996, copper metal cathodes (99.999%) applying the Acidic Leaching – Solvent Extraction - Electrowinning method (Leaching - SX - EW). 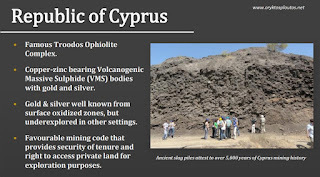 The ancient Cypriots were not only experienced miners but also skilful metallurgists. They discovered almost all copper ore bodies which have been exploited in modern years, and they were able to recover the rich part of the ore bodies by underground exploitation methods and produce high grade metal copper, called copper talents. The waste of the metallurgical treatment, known as ancient slug, has minimal residues of copper. Ancient slug may usually be found near the copper mines and is protected from the legislation as an ancient monument. In modern years, copper exploitation began around 1921 from the area of Skouriotissa and it was continued intensively up to 1974. Underground and surface exploitation methods were used for the ore recovery. The main underground methods which were used were the horizontal successive slices or levels followed by roof falling like top slicing and sub level caving, or fulfilment of the voids by stone filling or hydraulic filling like cut and fill and crosscut. The main surface method was that of the closed benches, primarily because of the topography of the mining areas. The works initially took place ​​by hand, but gradually the underground mines semi mechanized with pneumatic and electrical machinery like jackhammers, scrapers, autoloaders and locomotives. The surface mining took place with wagon drills, dozers, loaders and tracks which they were gradually modernized. Today there are about 25 abandon sulphide mines around the Troodos Mountain. Some of the mines are partly restored for purposes of access, prevention of the acidic drainages and reduction of the visual disturbance. A couple of copper mines have been restored or are under restoration by the land owners, in order to reuse their land. It is very interesting to note that this intensive mining activity did not prevent Cyprus to become a significant touristic center. In contrast the income from the mines was used for the tourism development and the mines became a source of inspiration for a lot of people to develop new types of tourism, like geosciences sites and mining heritage exhibition museums or sites. Also the mining areas may be transformed to touristic areas like excursion sites or as country clubs and golf fields. Λεπτομερή στοιχεία όλων των χαλκούχων - χρυσοφόρων Μεταλλείων της Κύπρου.